Biochar, otherwise known as charcoal, is an age-old method of increasing soil health. Learn more about the science and how to make your own biochar from expert Kai Hoffman-Krull. The question of growing food in changing climate is one we all need to be asking. We all eat. Predictions illustrate that climate change could cause irrigated wheat yields in developing countries to drop by 13%, and irrigated rice could fall by 15% by the year 2050. In Africa, maize yields could drop by 10–20% over the same time frame. The Intergovernmental Panel on Climate Change estimates that global food production could be reduced by up to 17% by the year 2100 due to crop failures from increased weather variation. The population in the year 2100 is estimated to be 11.2 billion people. As so many of us know, agriculture has been a part of the global carbon crisis that has brought us to this point in history. Research suggests that up through the turn of our century agriculture has been responsible for one-third of our global greenhouse gas emissions. The production of food makes up the lion’s share of all food related greenhouse-gas emissions—86%. How we grow food is a part of how we heal our atmosphere. As a part of a larger movement of regenerative carbon-based practices, including reduced and no till systems, cover cropping, green manures, rotational grazing, composting, etc., charcoal, also known as “biochar,” is illustrating the ability to decrease carbon mineralization, making carbon more stable in the soil, while also increasing biological activity. This research suggests that biochar could assist all of these other regenerative practices, maximizing their carbon storage capabilities. This article will cover some of this research, as well as biochar’s influence on soil resiliency in the biological food-web and how you can make charcoal on your own farm. As we know, carbon is the word we use to describe the life that came before, all of the organics that have come and gone and now rest in the soil. The question of how farmers interact with the carbon cycle and store it in our soils is a part of not only addressing climate change, but also preparing ourselves for it. Carbon farming is the science of resiliency—the question of how to create stronger, more nutrient dense foods with the ability to withstand greater levels of stress. As farming mentor and biochar expert Steve Bensel says, the pinnacles and practices of the original organic food movement were around understanding the carbon cycle. There is a large body of research to suggest that biochar can play a role in helping other carbon-based practices go further, stabilizing the native carbon in the soil. This goes beyond what I and many people thought, which is that biochar stores roughly 50% of carbon in the biomass converted to pyrolysis, which can last as a stable carbon source in the soil for thousands of years. A paper published in 2014 found that charcoal reduced carbon mineralization and off-gassing by between 64.9-68.8%, a phenomenon they termed the negative priming effect. This means that between 64.9-68.8% of the native soil carbon—the carbon already in the soil—was stabilized and kept in the soil. The negative priming effect was then confirmed by a meta-analysis paper that examined 395 research publications on charcoal and carbon off-gassing, finding an average of 40% decrease in carbon off-gassing, known as respiration, while also seeing an average increase of 18% microbial biomass. Consistent with previous studies, our results showed that higher pyrolytic temperatures led to increases in specific surface area and moisture retention while decreasing CEC and DOC content (Mukherjee et al., 2011; Wang et al., 2013). The characteristics of these high temperature biochars promoted greater negative priming of (Soil Organic Matter) in our study, and they have recently been advocated as the best type of char for maximizing soil C storage (Yuan et al., 2014). Yuan, et.al. found that lower temperature biochars may have other benefits, showing increased ability to retain nutrients and moisture and immediately bio available carbon. The paper concluded that both high and low temperatures of biochar may play unique roles in soil health, with high temperature biochars serving as a longer influence in stabilizing carbon levels, with lower temperature chars having a more immediate influence on nutrient retention, water retention, and biological activity within the first several years. 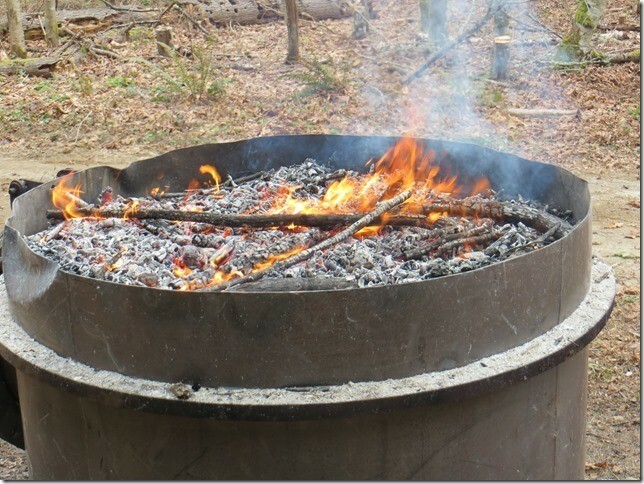 If you are interested in making biochar, here are two easy, low cost and low-tech ways to make charcoal from burn pile materials and/ or material from your surrounding forests. Conservation burns are the simplest and most accessible form of biochar production, as all they require is systematically stacking wood in a pile. The theory behind conservation burns is that all the feedstock reaches the same point of fully volatilizing organics, at which point the fire is put out. 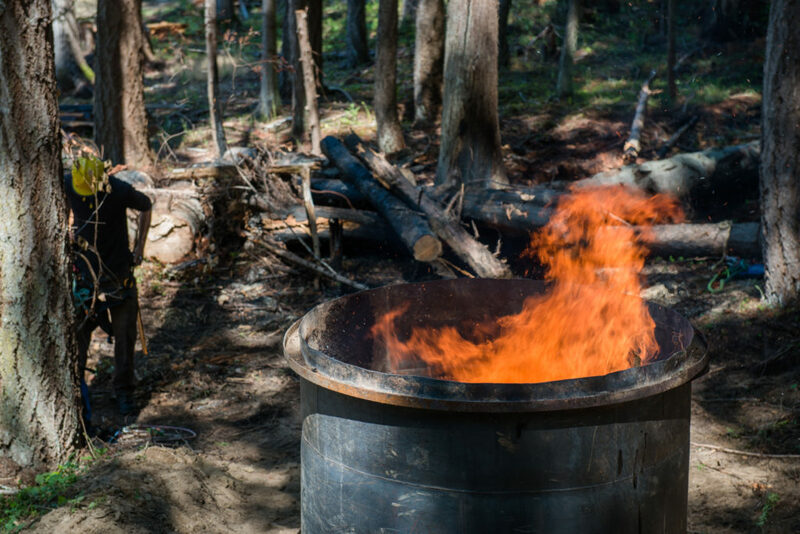 The method mimics many of the elements of slash burn piles, the most common method for brush and woody biomass removal, but generates a valuable product while also lessening the sterilization of soil in the location of the burn. Conservation burns can be done on a variety of scales and with a variation of wood sizes, but requires a small range of diameter within each burn to work effectively. Conservation burns do require a significant amount of water to extinguish, so burns would ideally be conducted near a pressurized water source. By lighting the conservation burn on the top, the coals held in the flames are held in a less oxygenated environment as the fire moves down towards the newer material. These flames consume oxygen that would otherwise directly access the coals. Whereas flame cap kilns look to eliminate oxygen to the charcoal by raising the fire box by adding more material, conservation burns operate as one large fire zone where the operator puts the fire out at the stage they would otherwise add material to a kiln. The success of Conservation Burns is dependent upon how the pile is constructed. Feedstock should be somewhat homogenous in diameter, with the largest pieces only several inches larger than the smallest pieces. Length can vary more significantly but keeping material to a range within 1-4 feet in differential will improve the rate of consistent biochar production. Material should be constructed in a cone, with the largest material placed in the center of the burn, with material graduating to smaller diameters as the pile moves towards the bottom and the top. This is because the center of the fire will produce the highest heat, and thus can char the larger. Once the pile is constructed start a fire at the top. If there is wind, the pile should be lit on the downwind side 2/3 of the way towards the bottom. Drier material is more important for conservation burns than other forms of production, as higher moisture content in the feedstock will result in a slower development of the fire, resulting in the top material turning to ash before the lower sections of biomass convert to charcoal. 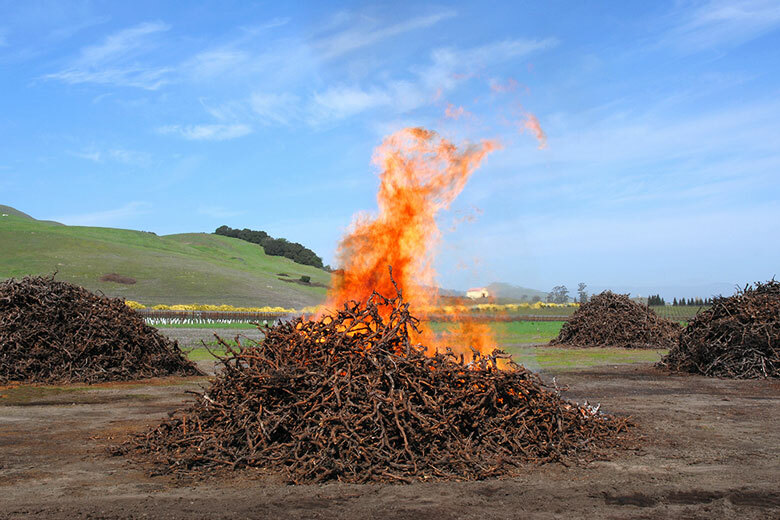 The goal of the conservation burn is to have the pile torch quickly, with the fire moving from the top of the pile to the bottom in between 2-20 minutes depending on the size of the pile. The ideal time to extinguish the burn is after the fire has reached the bottom of the pile and a slight coat of ash can be seen on all the material from top to bottom. Conservation burns conducted with dry material consume most volatile gases in the fire box, which feeds the fire and decreases emissions into the atmosphere, especially in comparison with traditional slash pile burns. The ideal way to extinguish conservation burns is by spraying the fire with pressurized water. It is important to make sure the pile is fully saturated before leaving, as often the pile can appear extinguished but have a small amount of live coals that can dry out the surrounding charcoal and start the pile on fire again. Flame Cap Kilns use a metal cylinder or box, with either an open or closed bottom. 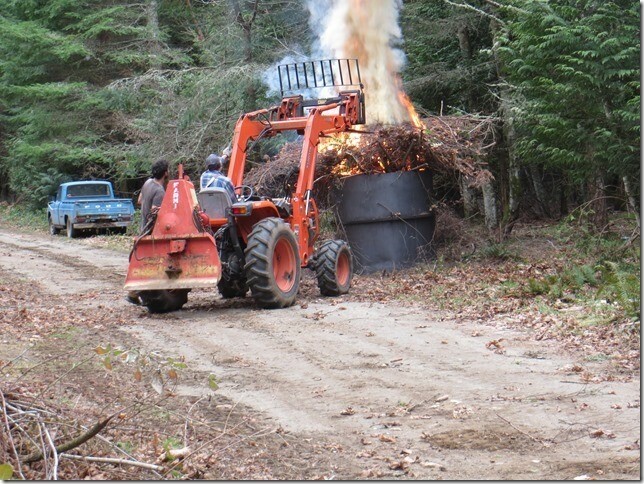 One of the significant advantages of Flame Cap Kilns for farm and forestry production is that material can be loaded throughout the burn process, with the conclusion of the burn occurring when the kiln is filled with biochar. This allows for increasing the amount of biochar produced as well as eliminating larger quantities of slash material, making it ideal for forestry or on-farm production. Flame Cap Kilns eliminate oxygen access on the sides of the fire. The area of active flame rises with the addition of new material, consuming the oxygen that would otherwise access the charcoal below. Kilns can be made from a variety of diameters and heights, with larger diameter and shorter dimensions resulting in hotter, quicker burns and lower efficiency of converting biomass to biochar. Taller and more narrow kilns result in cooler, more efficient burns. A general guideline for an ideal kiln size is 1.5:1 ratio of height to diameter, however many different ratios can be effective. If you are cutting a metal cylinder or box to create a kiln, it is important to discover if the container has previously stored any flammable products. If so, fill the container with water before cutting, as a spark can catch residual gases left in the container, providing the potential for an explosion. Make a hot fire using kindling and small sticks. If the kiln has an open bottom, allow air to enter the kiln from the bottom to facilitate starting the fire, which can be done by simply shoveling out several access points where the cylinder bottom meets the soil. 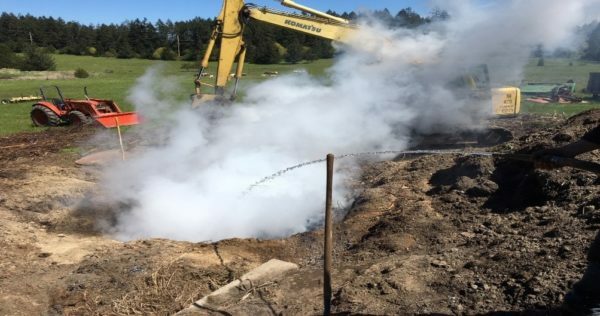 When the fire is burning well, usually 10-20 minutes after starting the burn, seal the bottom of the kiln with dirt so that no air enters from the bottom perimeter. Add material when you see the top of the existing material develop grey ash on the exterior. It is helpful to add material of similar size, moisture content, and wood type for each loading, as the material will transition to a similar stage of charcoal at the same time, maximizing the efficiency of the burn. Place the largest diameter material one third of the way through the burn process, as that is the point of maximum heat. Continue adding fuel until the kiln is full of char or you run out of fuel. As the level of charred wood rises in the cylinder, the lower level of the outside of the cylinder should be cooler than the area of active burning, indicating that no oxygen is entering the kiln from below. Clean burn with heat waves is the ideal. White smoke is a result of steam off gassing and is not a significant issue as it is mostly water entering the air. Blue smoke illustrates that some volatile gases are not burning and that the fire is cooler than ideal. Stop adding fuel or begin adding drier fuel to correct. Yellow and greenish smoke is the production of methane (harmful greenhouse gas) and other volatile gases, which means that the fire has gotten too cool and gases are not being consumed by the fire. This is an important time to stop adding fuel and let the burn clean itself up. Yellow smoke means that too much material was added at once cooling the fire so that organic volatile gases rise into the atmosphere. There are two different methods for extinguishing Flame Cap Kilns: excluding the fire from oxygen with a lid or using water. The lid method is ideal for forestry application where water access may be limited. To use the lid method, create a lid 1-2 inches smaller than the diameter of the kiln, so that the lid can sit inside. The ideal material for lids is used metal roofing that can be screwed together with roofing screws and cut with an angle grinder or Sawzall. Put 10-15 gallons of water evenly around the top of fire, and then add the lid inside the kiln. Seal the gap between the lid and the edge of the cylinder with soil. Steam leaks will indicate the need for a better seal. Once the cylinder has cooled off entirely (this takes at least 2 days), tip it over to retrieve the biochar. Be very careful with fresh char, as it can hold heat for a surprisingly long time. If a still-live coal is exposed to air, it will burn. Make sure there is no heat in the char before transporting. You can use the water method if there is plenty of water available close to the fire source (80-100 gallons). This method is more ideal for kilns that have closed bottoms, as the water will rise in the container and submerge the coals. If the kiln does not have a closed bottom, spray down the top of the fire and then tip the kiln over either by hand or by mechanical means, such as a tractor or come-a-long. Spray the charcoal with water while raking it around. Continue stirring and wetting the char while looking for hot spots. Any steam issuing from the pile after 30 minutes of applying water indicates that the fire is not out. After an hour or two, return to the pile and spray and rake it again. It is highly recommended that the char be inspected several times more before assuming that the fire is out, and the char is safe to handle and transport. The term biochar can sound new, but there is nothing new about charcoal. Charcoal is as old as fire, and fire has served as a central element of thinning old growth forest ecosystems. In San Juan County, the Salish people of the Puget Sound also used fire to cultivate their wild foods. While the first European settlers thought the forests of the Pacific Northwest were forests naturally abundant with food crops, they were actually gardens. The Salish people used fire to drive deer and elk into central locations where they could be more easily hunted, and burned their most common root and berry crops after harvest. Controlled burns served to replicate the role of wild fires in old growth systems, thinning and cleaning the forest floor while providing ash and charcoal to fertilize the next generation of plants. There are illustrations that fire and charcoal were also used for agriculture historically in South America and parts of Europe. Today biochar may hold more significance than ever before. As we search for ways to be keeping carbon in our soil and out of the atmosphere, biochar may not be the answer but it may be a part of helping all the other answers. For more information about biochar’s uses, processes, and benefits, visit Restore Char. This post is based on an article coming out in Growing for Market, May 2019. Positive and negative carbon mineralization priming effects among a variety of biochar-amended soils Andrew R. Zimmerman a,*, Bin Gao b , Mi-Youn Ahn, 2011. George Vancouver, A Voyage of Discovery to the North Pacific Ocean and Round the World, 1791-1795, vol. II. W, Kaye Lamb ed. (London, 1984), 568. Black carbon and soil properties at historical charcoal production sites in Germany, Borchard, N. et al 2014. Kai Hoffman-Krull is the executive director of Forage, an ecology journalism nonprofit, focusing on studies and projects around plant resiliency in a changing climate. 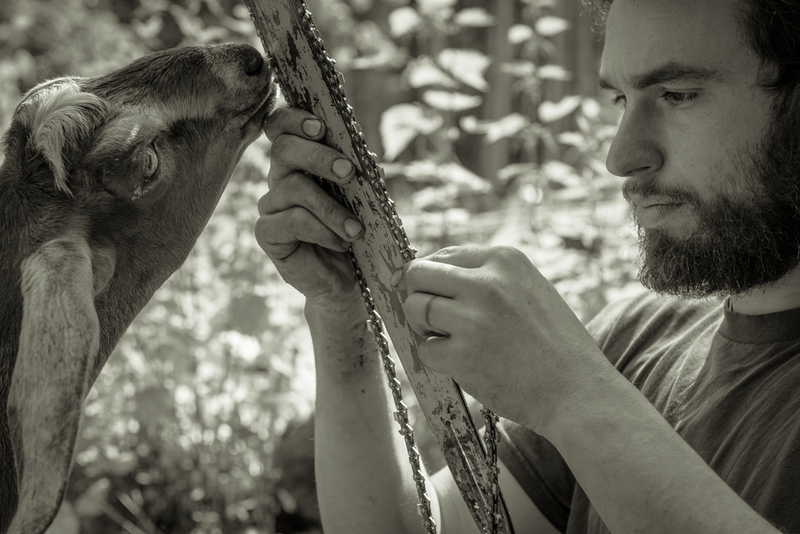 He runs a research market garden on his homestead in the San Juan Islands, where he examines the efficacy and economics of carbon-based cultivation practices. Visit restorechar.org for more information.